Changing your font might be a necessary task to make your phone usable, or you might just be looking for an easy way to make your phone feel a bit different and refreshing. Whatever your reason, switching up fonts for Android devices is not as difficult as it sounds. Here's how to do it through stock settings and third-party apps. Most phones now let you make some changes to the font and appearance settings without needing to install third-party apps, though the variety of what's on offer might not be as wide as a dedicated app. Exactly where and how you access these settings could also vary as a result of operator tweaks to the OS but generally, you'll want to head to Settings > Display > Font to access the font style changer for Android. On a Samsung phone, as it's the example being tested, you can also head to the Settings > Accessibility menu if you want to change the contrast or size of the phone fonts. Samsung's handsets come with a few alternate options pre-installed and ready to apply, but additional phone fonts for Android can be downloaded through the settings menu in the Font section. Hitting the 'Download fonts' button launches the Samsung app store and a range of more fonts that you can download. Some are free, others require payment. If you're using a non-Samsung phone, you'll probably have similar options in your settings menu but might not have the luxury of a pre-made app section dedicated just to fonts. Never fear though, changing the fonts for your Android is still pretty straightforward. If you want to do more than just change the style of the phone font you're using, one of the easiest ways is to install a third-party launcher, which tend to offer reams of customization options. You've probably got your own favorite launcher already that lets you change the font settings in just a few taps. If you don't, you could use something like Action Launcher 3. Exactly how wide-ranging your options are will depend on which launcher you choose. For example, Action 3 gives you the option of using different weight and styles of the Roboto font (the default) but no other options. Similarly, the free version of Nova launcher and apps like Smart Switch and Arrow Launcher don't really allow for any changes to be made at all. If you're in need of a deeper font style changer for Android than your launcher can offer, you'll be better off installing a dedicated phone fonts app, which will allow you to do things like customizing the font for each app, should you wish to do so. If you search on Google Play for font apps, you'll get a whole lot of options - and it's worth pointing out that some of them require root for certain options to work, whereas others don't. It's going to take a bit of trial and error to see what works best for your own situation. FontFix is a great answer to this problem but not if you're using a Samsung phone. While the way in which you can quickly search, select and preview a whole load of different phone fonts is incredibly handy, Samsung's blocked that ability on many of its handsets. Non-Samsung phones that aren't locked down in a similar way will have no problem though. All you need to do is select the font you want and click the Install button, at which point it'll need to be downloaded and activated. Additional fonts for Android are side-loaded directly into the app rather than updated via the Play Store, so you'll need to allow installation from unknown sources first too. You can easily find a list of all the fonts you've downloaded over time and dig into each for some more information before downloading them, including finding out how much space they'll take up on your phone, which is handy if you're planning to install a lot. iFont is another highly capable app for changing your system font but it's another that you're going to struggle to use if you have a Samsung phone. To be fair to iFont, it tries a little harder to provide a workaround for handsets (like Samsung) that block the installation of alternate free fonts but in our testing, it doesn't work on an S7 Edge. In the settings menu, you can select your handset manufacturer, which will enable the options to try and help you workaround limitations without requiring root access. However, for every single font tested, none of them would work on a non-rooted S7 Edge. One of the key advantages that iFont has over other font apps, in addition to its wide selection, is the ability to choose a font based on language from a few different options, including French, Spanish, Arabic, Russian and more. The English translations within the iFont app itself aren't great but don't let that put you off. If you're in need of changing your font, you can do a lot worse than iFont. If you're looking specifically just for handwriting style fonts and iFont doesn't have what you want, there are many, many apps on the Play Store that should have you covered. You can also check out our guide on how to make your font look like your own handwriting. What're your favorite fonts for Android apps? Let us know in the comments below! but seriously why doesnt android just allowed installed some otf/ttf/whatever font files and then set them? I mean you might want to use a totally different font than what any of those services may offer. 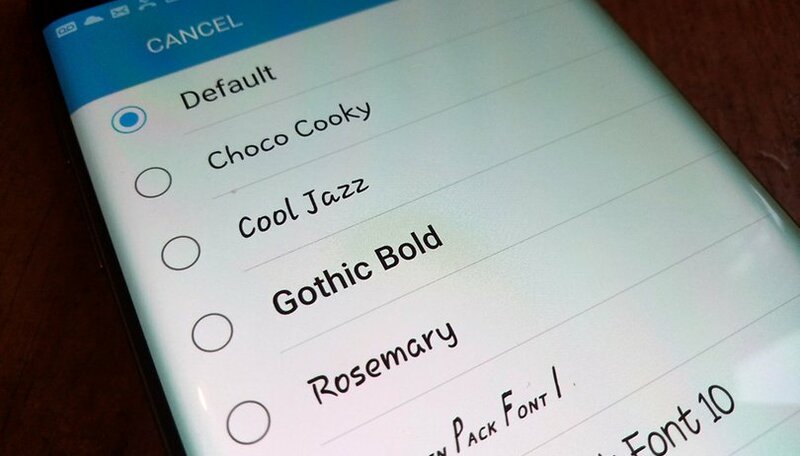 Samsung also offers a cool option to customize and personalize your fonts, specifically for Samsung devices. Check out Flip Font in the Google Play store. Do you now if it works with other devices, for example With Android One? Hello, I have a Galaxy J 7 running Marshmallow . Here's how to install and change fonts using the IFont app. The very first thing to do is to set your font style to "default" . (Settings - display - font - choose "default"). Then, open IFont app. Choose your font . Download it. Choose "set". A screen to install the font will come up. Choose "install". Finally, go back to your display settings. Choose font setting. Your newly installed font will be in your list of fonts . The important thing to do is to set your font to "default" before you open the IFont app to choose your font. This works perfectly for me. i am also using galaxy j7 but cannot change font using ifont. how come it perfectly works to you? That would depend on your phone.